All of the hardware shown below is for use with our feather flags. To use your feather flag, you will need a flagpole set and flagpole holder. This 4-Piece Flagpole Set fits all of our 13.95 feather flags. These 4 pieces slip together like tent poles to create one 15ft pole PLEASE NOTE: if you are going to use your flag in the dirt or grassy area of you lot, you will also need a ground spike which can be found in our FLAG HARDWARE category. 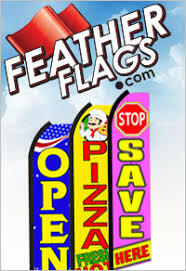 Now You Can Fly Your feather flag on the roof of your building! Designed to hold our aluminum 4-piece flagpoles. Attach this bracket to the top of your building. Made of heavy duty steel, each bracket has a 4 inch x 5 7/8 inch plate with four holes to allow for easy mounting. Small hole at the bottom of the 5 inch tall shaft allows for water drainage. Now You Can Fly Your Feather Flag on a fence or building! Designed to hold our aluminum 4-piece flagpoles. Attach this bracket to fences, near the top of square light poles or buildings. Made of heavy duty steel... each bracket has a 4 inch x 5 7/8 inch plate with four holes to allow for easy mounting. Small hole at the bottom of the 5 inch tall shaft allows for water drainage. This pole base is specially designed to be used with our aluminum 4-piece flagpole. Use this item when you want to install your feather flag on a hard surface. Made of anodized aluminum, this base will not rust. Do not use this item in an area where wind could cause it to fall over. This flagpole holder is specially designed to be used with our aluminum 4-piece flagpole set. Use this item when you want to install your feather flag into a grassy area on your property. Made of anodized aluminum, this base will not rust. Use a mallet or hammer to pound spike into ground. This flagpole holder is specially designed for use with our aluminum 4-piece flagpole. Use it when you want to install your flag using the weight of a vehicle to hold it in place. The u-shaped wheel base stand is made of galvanized steel and is designed to be kicked under the tire of any vehicle. Completely portable, this Tire Base stand can be moved any where on your lot in minutes. This base is designed for use with car tires. For SUVs and TRUCKS, please purchase the large wheel base flagpole holder. Please remember to remove the pole from the base before driving a vehicle on or off of the base to prevent damage or injury! Now You Can Fly Your feather flag from the back of your vehicle. Designed to hold our aluminum 4-piece flagpoles. Attach this bracket to the back of your car, truck or rv. Now You Can Fly Your feather flag from the back of your vehicle. Designed to hold our aluminum 4-piece flagpoles. Attach this bracket to the back of your car, truck or rv. This flagpole holder is specially designed for use with our aluminum 4-piece flagpole. Use it when you want to install your flag using the weight of a vehicle to hold it in place. The u-shaped wheel base stand is made of galvanized steel and is designed to be kicked under the tire of any vehicle. Completely portable, this Tire Base stand can be moved any where on your lot in minutes. The Spinner fly is specially designed for our 4-piece flagpole. It is is a must for windy areas. It will prevent the flag from flying away, and it will also allow it to spin. The spinnerfly should be used if you are going to fly your flag at an angle. The Spinner fly is specially designed for our 4-piece flagpole. It is is a must for windy areas. It will prevent the flag from flying away, and it will also allow it to spin. The spinnerfly should be used if you are going to fly your flag at an angle. Designed to hold our aluminum 4-piece flagpole vertically. Attach this bracket to fences, square light poles or buildings. Use this base to hold your feather flag on concrete or other hard surfaces. Our sturdy Water Base weighs 40 lbs when full of water Simply lock the connecting post and coupler ring to the water base. Insert flagpole and twist coupler ring to tighten to fit the diameter of the pole. Adapters are conveniently stored on the underside of the base. Can also be filled with sand. Use this fender guard when you are using the wheel base flagpole holder. 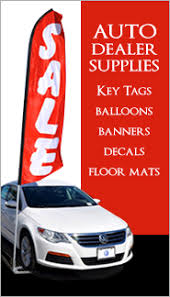 It is designed to protect your car fender from the flagpole rubbing or scratching it. Use this fender guard when you are using the wheel base flagpole holder. It is designed to protect your car fender from the flagpole rubbing or scratching it.